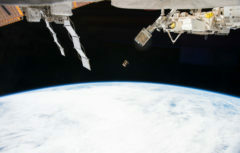 Early this morning, NanoRacks successfully completed the Company’s 13th CubeSat deployment mission from the International Space Station. As these five CubeSats enter low-Earth orbit, this brings NanoRacks to 176 total CubeSats deployed into space via the NanoRacks CubeSat Deployer (NRCSD). In total, the Company has deployed 193 satellites into space. The Arcsecond Space Telescope Engabling Research in Astrophysics (ASTERIA), is a 6U cubesat from MIT and JPL. Asteria is a technology demonstration mission to enable high-precision photometry through radiometer instruments. The mission goal is to test new technologies for astronomical observation, such as the detection of planets outside of our solar system using the measurement of stellar brightness over time. Asteria uses advance pointing control technology and new thermal stabilization features to perform these complex measurements.